-enamel – is the outer hard layer of the tooth composed primarily of minerals. Enamel is actually considered the hardest substance in the human body. -dentin – is a calcified tissue that makes up the bulk of the tooth located beneath the enamel layer. -pulp – is the center layer of the tooth made up of blood vessels, nerves and connective tissues. This is the part of the tooth that is responsible for supplying a growing tooth with nutrients. Root canal therapy is a dental procedure used to remove infected, damaged or dead pulp from a tooth so that the tooth can be saved from extraction. Once the infected pulp is removed, the interior of the tooth is thoroughly cleaned to ensure that further infection is not possible. The void inside the tooth is then filled with a bio-compatible material and the tooth is restored back to it’s full function. If any of these occurs there will most likely be clear symptoms of infected pulp which needs to be removed asap. What are some clear signs that I may need a root canal treatment? These symptoms should not be ignored. Visit a dentist if you notice any of these symptoms before an easily treated problem progress’s into something much worse. What happens if I don’t get root canal treatment right away? Not getting root canal treatment can lead to further complications in the mouth. Allowing infected pulp to progress for too long can cause an abscess in the tooth, which is a collection of pus where the gum line meets the infected tooth. This infection is much more severe than a pulp infection and in some cases, if the bacteria gets into a patients blood stream, can be fatal. How will root canal treatment save my tooth? By removing the infected pulp from inside of a tooth, the main structure of your tooth, made up of dentin and enamel, will remain intact. The most important implication of this is that the tooth root will remain in the jawbone, keeping the structure of the jawbone strong into the future. Saving the original tooth will also mean that the tooths function will carry on as usual allowing you to chew and speak without difficulty. 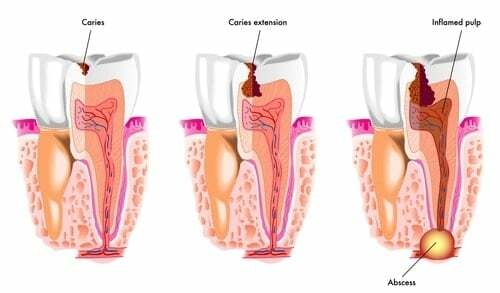 What is the root canal therapy procedure? -Tooth examination – your endodontist will first have to take radiographic images of your mouth to determine which tooth, if any, has infected pulp. -Local anesthetic – the endodontist will then numb the area of the mouth where the infected tooth is to make to procedure as comfortable as possible for you. -Placement of dental dam – in order to prevent saliva or bacteria from getting in the way of the procedure, a rubber barrier known as a dental dam is carefully placed around the infected tooth. -Incision in the tooth – an opening is cut into the top of the tooth so that the infected pulp can be removed from the pulp chamber and root canals. -Final touches – before filling the chamber, your endodontist will thoroughly clean and disinfect the pulp chamber and root canals and shape the chamber for a filling to come. -Fillilng the void – the final step is to fill the void pulp chamber and root canals with a bio-compatible material and seal if with an adhesive. The most common material used for filling the chamber is a rubbery substance called gutta-percha. 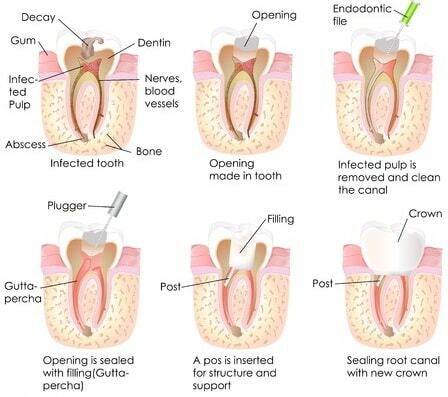 One the root canal procedure is finished, the tooth will be restored to it’s full function either by your endodontist or by a referred dentist. How is my tooth restored after the treatment? After the infected pulp is removed and the root canal and pulp chambers are filled with gutta-percha, you will receive a crown or other type of restoration to return the tooth back to full functionality. This should make the tooth look and feel like the original tooth giving you full chewing and speaking capabilities as if there was never a problem with the tooth to begin with. With advances in modern techniques and the use of local anesthetics, most people do not feel discomfort or pain during a root canal treatment. After the treatment, however, you may feel some degree of sensitivity in the treated tooth for a few days, especially if the infection was severe. If the pain or discomfort persists for more than a few days you must go back to your dentist as there may be a secondary infection that needs immediate treatment. How do I need to care for my tooth after the treatment? 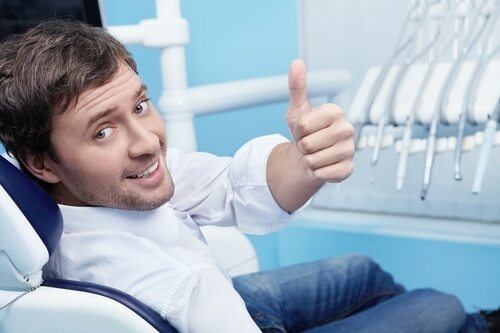 Once root canal treatment is complete and you have received a crown or other restoration, your saved tooth will feel and look just like any other tooth in your mouth and should be cared for in the same way. If you have any concerns, ask your dentist for a recommended oral hygiene practice to maintain good oral health.